A new study, coming out of the University of Trento in Italy, takes a look at what types of visual content have the most viral potential on Google+. Although the study focuses on this one social network, the implications of its findings are intriguing and provide insights that can translate to other social platforms. Comparing image attributes such as static vs. animated, portrait vs. landscape, color vs. black and white, and a variety of others, the study also points to potential avenues for optimization of content that gets shared on social networks. Not all social interactions are created equal. According to the study, getting a +1 or a comment indicates a different user motivation than a share does. One hypothesis is that a +1 and a comment are both acts of admiration. That is, if a user comments on content in Google+, he or she is giving that content a nod of approval — a virtual thumbs up. A share, however, is a fundamentally different type of action. As the study theorizes, shares are acts of self-reflection. Users are more apt to share content that they can personally identify with and that they feel is representative of their own experiences. Interestingly, since different motivations drive different types of sharing for the same content, the researchers found that while +1s and comments were well correlated, shares were not. This indicates that marketers can and should think about the type of social interaction they’re trying to encourage, and create content tailored toward those goals. What this means: Before sharing content, consider your primary social goals to better choose what content can serve these goals most effectively. Are you mainly trying to improve consumer perception of the brand, or are you mostly concerned with social metrics and increasing general brand awareness and interaction? If you’re doing the former, seek out admiration-type metrics (comments and “likes”) and don’t worry as much if your share numbers are low. You can post branded content as long as it’s amusing, aesthetically pleasing, inspirational, or communicative of another positive emotion. 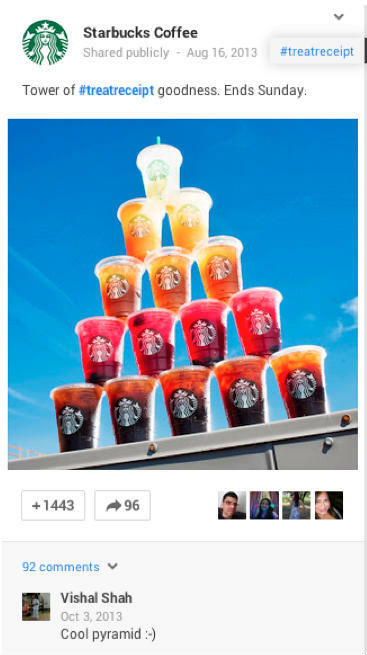 For example: The Starbucks post above is a good example of content that can promote positive feelings toward a brand. 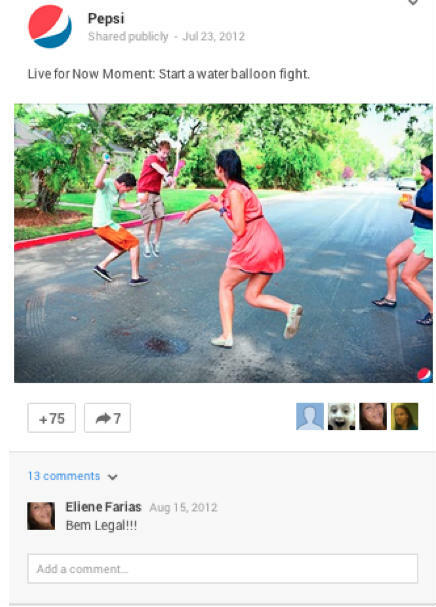 Even though it’s clearly branded, it received close to 1,500 “likes” because it’s a fun, aesthetically pleasing picture. To improve your brand’s reputation, post content that demonstrates the qualities you want associated with your company. This post, on the other hand, has no visible branding but still performed well all around, in addition to being shared 124 times and receiving many comments. People shared this post to provide value to their followers by curating content they think is useful. Furthermore, this post is about making homemade coffee — something many people may be interested in. 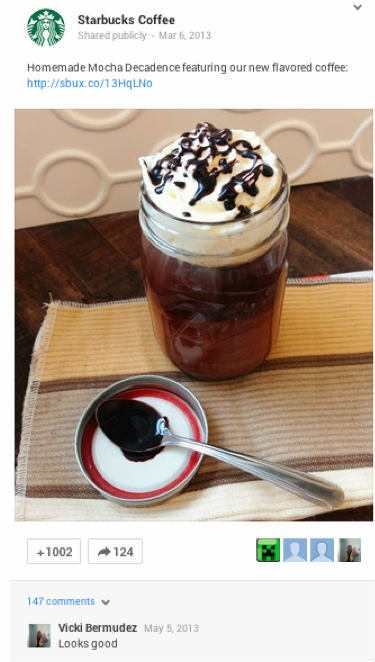 Those who share this content are, in effect, communicating that their love of coffee is so strong that they would likely enjoy a delicious DIY concoction. Appeal to self-identity in this way to get more shares and, thus, more brand visibility. According to the study, some images are more likely to drive +1s and comments, while others are more likely to result in shares. The difference, as we mentioned, lies in posting images that trigger admiration vs. those that can serve as a means for users’ self-expression. Although the study doesn’t go into specific detail about a large variety of image types that might fit into either category, it did find that images containing a face were more likely to garner +1s and comments, rather than shares. This makes sense, as users are more likely to admire or “like” an image of a person than to utilize another person’s image as a vehicle of their own self-expression. What this means: If your goal is to get more shares, make sure your visual content is relatable, and versatile enough to be representative of a wide audience. If your content involves pictures of people, it’s more likely to be “liked” or commented on — making it more suitable for representing your brand’s values. This post from Pepsi features real people, which is probably why it has 75 likes, but minimal shares. The sentiment it conveys — living in the “now” — is a popular one, but the imagery is too specific for many people to relate to and, thus, share. However, it does serve as a great representation of the brand’s values, which makes it a solid effort for appreciation-based social content goals. In contrast, this Wendy’s post is better focused on driving shares. 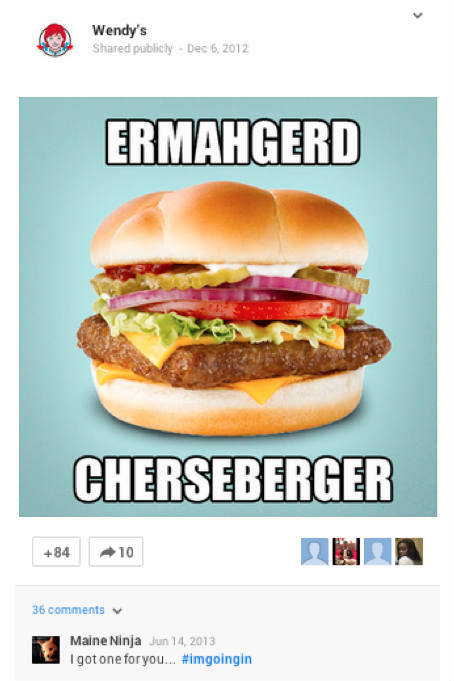 Most of the content on the Wendy’s Google+ account is branded and receives few shares. But this post was shared more than most of its content because it focused on a popular meme, rather than the brand’s logo. 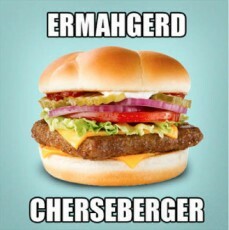 As a love for cheeseburgers is fairly universal, and people enjoy circulating comedic content in order to reflect their own sense of humor, this content was primed for shares. The study found that text-only posts were more likely to drive commenting than image posts. The assumption here was that text-only posts elicit more “linguistic-elaboration.” In other words, we are more likely to respond with words when presented with words. In addition, while posts with images were found to be more likely to be readily shared and liked, this increased efficacy only works to a certain extent: The study found (somewhat surprisingly) that image posts are more likely to acquire +1s up to a threshold of 75. After this threshold, text-only posts are more likely to achieve viral appreciation. The conclusion here is simple: It’s easier to impress with images, but high-quality textual content can be even more impressive. What this means: The use of images and other visual media is essential for grabbing viewer attention and driving initial shares, but the quality of your content’s message is what truly drives viral spread. 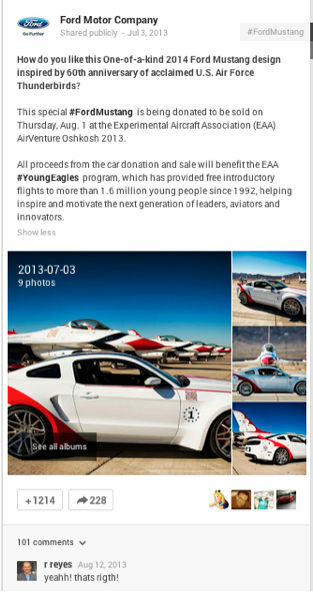 Images look nice on the Google+ format, but make sure you keep more than just design in mind, and include valuable, text-based content, too — especially if your primary goal is to mold your brand’s reputation. For example: This Ford post is a great example of how a few images and short paragraphs can turn pictures and words into a story. The text-based content provides context for the images underneath it, so readers can fully appreciate the visual component of the post. The text also describes the worthy cause Ford is participating in, which sends out a positive brand message and makes this highly “like”-able. But this textual post also garnered 101 comments, meaning it succeeded in creating a conversation with followers. Keep these content combinations in mind, especially when seeking to use visual content for brand promotion. The study looked closely at the unique attributes of different types of images to determine which led to more +1s and comments and which led to more shares. To begin, the study found that static images are two to three times more likely to drive a +1 or a comment, while animated images (such as GIFs) are two to three times more likely to be shared. A correlation was also found between the orientation of an image and the volume of the different types of shares it earned. Vertically oriented, or “portrait,” images seem to perform better in terms of +1s and commenting, while horizontally orientated, or “landscape,” images are more likely to be shared. Square images were found to “place themselves in the middle” of any of the collected metrics. Colored images were correlated with higher +1s and commenting rates, but were not highly correlated with an increased volume of shares. Additionally, the study found that images with very high levels of brightness were much less likely to be +1ed or commented on, although they seem to be slightly more likely to be shared. Examining the bright images utilized in the study, screenshots of applications and social networks seemed to dominate. What this means: Once you’ve decided on the content of your image, make sure the design, layout, content type, etc., are optimized for greater likelihood of achieving your particular marketing goal. 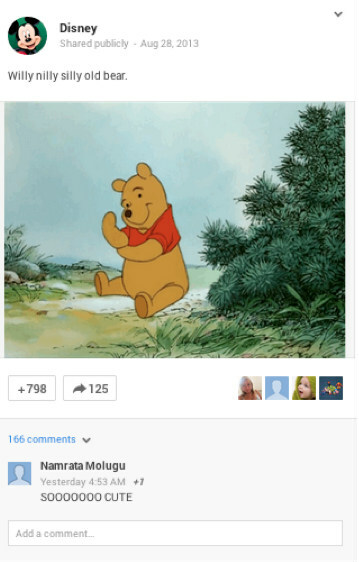 For example: Disney’s Google+ account features several animations that have high sharing metrics, like the one shown above. Disney’s been a well-known brand for decades, so optimizing this already relatable content with a format that drives sharing is the perfect setup for better branding results. Redefining viral metrics into the categories of “appreciation” vs. “self-expression” is valuable to brands, and could have an impact on the variety and approach certain visual content initiatives can take. 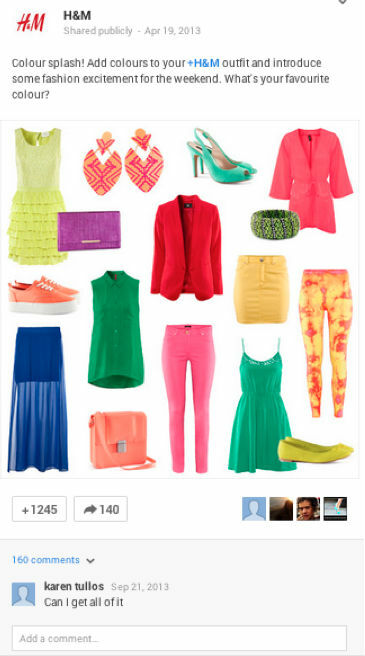 This H&M post illustrates how many of the techniques discussed in this post can be used together to create visual content success across the board. For one, the picture is square-shaped, meaning it’s not leaning toward a higher probability of being liked/commented on as opposed to shared. However, its vivid colors make it really appealing to the eye and very “like”-able. It received a high number of shares, too, likely because it only features the brand’s clothing and accessories — not people wearing them. This allows fans to share the image as a reflection of their own sense of style, without limiting its appeal to only those who relate to the people in the image. All of these characteristics come together to create a post that achieved well-rounded success. Although experimentation and segmentation are key to determining how well this study’s findings match the experience of your brand, understanding that a fundamental difference exists in the motivation of different types of sharing can help marketing teams generate content that is more shareable and engaging. Dan Tynski is VP of Business Development at Frac.tl. Previously, Dan co-founded Voltier Digital, and has worked for nearly a decade in viral content creation and promotion. He is driven by a relentless desire to push boundaries in new technologies, creating disruptive marketing techniques that provide clients with unexpected levels of ROI.